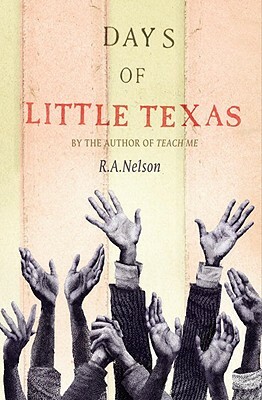 TheReadingWarehouse.com:Days of Little Texas:Nelson, R. A.
Annotation: "A ghostly love story from the author of "Teach Me. Welcome, all ye faithful--and otherwise--to a ghost story, a romance, and a reckoning unlike anything you've read before. Acclaimed YA author R. A. Nelson delivers a tantalizing tale set in the environs of the evangelical revival circuit and centered around Ronald Earl, who at ten became the electrifying "boy wonder" preacher known as Little Texas. Now sixteen, though the faithful still come and roar with praise and devotion, Ronald Earl is beginning to have doubts that he is worthy of and can continue his calling. Doubts that only intensify when his faith and life are tested by a mysterious girl who he was supposed to have healed, but who is now showing up at the fringe of every stop on the circuit. Is she merely devoted, or is she haunting him? Fascinating and original, this is an unusual story whose reverb will be deeply felt and which will inspire lively book discussion. Ronald Earl, a.k.a. "Little Texas," has been preaching since he was ten. Now, at almost sixteen, he begins to doubt his calling--just as a mysterious ghostly figure appears. The protagonist's compelling first-person narration, peppered with biblical language, is full of relatable uncertainty. As the story accelerates, readers will find themselves startled by both the personal and actual demons Little Texas must face. Copyright 2010 Horn Book Magazine Reviews. [Page 52]. Copyright 2009 Reed Business Information. [Page 132]. Copyright 2008 Reed Business Information.